While the mobile market is constantly being flooded with new devices every month, cloned phones also known as fake phones are also finding it’s way into the market. Normally, finding fake phones are mostly common among globally known brands like Samsung, HTC, iPhone and a few others. No, these companies do not produce these fake phones. 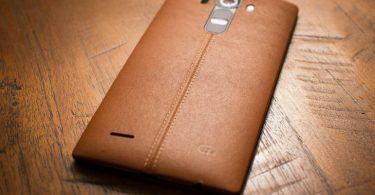 Most other brands looking to defraud people, actually produce these phones. Infinix says there are now cloned (fake) infinix phones in the market which could certainly mean that infinix phones are now hot cakes. 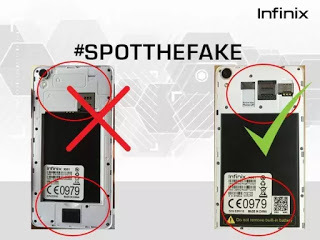 We recently shared with you, a critical as to how to spot the fake infinix hot 2 from the original and we have got our hands on same information regarding the infinix Hot Note x551 phone. You would agree with me that the infinix hot note phone needs no further introduction. 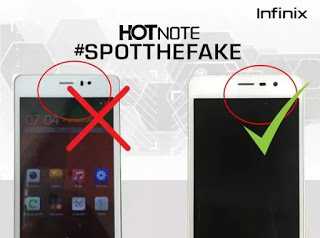 Without wasting much of your time, let’s quickly hit the hammer on the nail and that’s we talking on how to differentiate the fake infinix hot note from the original. 3. 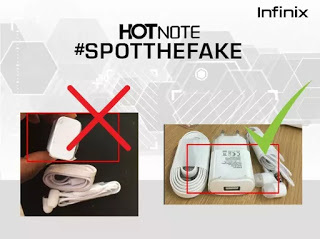 The charger that comes with the original infinix Hot Note is different from that of the fake. Virtually every Infinix phone I have used, comes with same charger design. The image below shows a different design for the fake. And oh, infinix says it’s charger is thicker. So, there you have it. Hopefully with the information above, you’d be able to spot and differentiate the original Infinix Hot Note 2 from the fake. An additional tip would be you operating a phone before you pay for it. 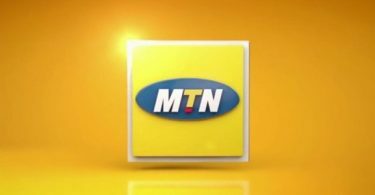 If during operation, you experience any form of lagging despite the phone claiming to run on a 2GB RAM, RUNNNNN!!! Thanks. This is a VERY useful article. Thanks for this Sam. It will certainly be of help.